Arundhati Roy's 'Broken Republic' is a collection of essays, featuring both reportage and analysis, that address India's protracted emergence as a global superpower. Ceasefire's Lucy Du reviews. John Berger once mused that “never again will a single story be told as though it were the only one”. Indeed, never before have we encountered an epoch more preoccupied with the construction of its own historical conception. The world’s narrative unfolds within a house of mirrors, its transitions an infinitely reflected spectacle spawning endless representations in multimedia formats. Such times produce an intriguing paradox: we are confronted with a phenomenon that creates the opportunity for both greater political transparency, and for greater opacity and censorship. The violence of “globalisation” and “development”, two seemingly innocuous terms, is something that Arundhati Roy is committed to expose. The Booker-winning novelist has, for the past two decades, been an astute critic of the rampant forces of neo-imperialism. Since the triumphant “God of All Small Things” – translated into 21 languages – Roy has published exclusively non-fiction. (“Fiction dances out of me,” she says, “non-fiction is wrenched out by the aching, broken world I wake up in each day.”) Her latest publication, Broken Republic, is an unflinching attack on the Indian government’s policy to allow “wholesale corporate takeover of people’s land and resources.” This collection of three essays outlines the context, developments, and impact of the worsening internal conflict gripping the heart of India. The Naxal-Maoist insurgency in India’s ‘Red Corridor’, a fifty-year-long struggle against the central government, has gained greater urgency with the launch of Operation ‘Green Hunt’ in November 2009. The deployment of paramilitary troops to intensify the offensive on “the biggest internal security challenge ever faced” falls, of course, upon the regions richest in lucrative natural mineral resources. While the insurgency claims to defend the land rights of the indigenous tribal people who inhabit the forested eastern part of India, the authorities maintain these are violently anti-national aggressors, obstructing India’s path to development. Clearing this path means clearing the tens of thousands of inhabitants, tribes and dissidents alike. It requires the state to violate its own constitution, which protects the land rights of the adivasi people, while legitimising this to the rest of the nation. A particularly interesting sophistication of the modern state is the manufacturing of consent, when the immense concentration of power transcends the material realm to deposit beliefs and attitudes within the citizenship through a pliant mass media. This is happening in India, according to Roy, where the uprising of the most exploited sections of society is being continually distorted to justify the state’s war against its own people. India is a country which is simultaneously home to sixty-nine billionaires and 836 million who live on twenty-five pence a day. This war is fought in the name of India’s “economic growth” – set to overtake China’s in just two years time – and fed to the middle/upper-class beneficiaries of said “growth” as a war for their protection. Broken Republic provides a vital challenge to the alienation and demonization of the Naxalite-Maoist uprising. Uncanny parallels are drawn between the manufacturing of consent by the state for India’s apparent self-cannibalisation and the War on Terror. Systematic manipulation – whether by states or powerful individuals – is as commonplace in this age of apparent “free-information” as it ever was, though familiarity may have caused it to be less visible. It is eerie to see the Indian government’s rhetoric on the insurgency parroted by The Economist in its obtuse critique of the government’s “pitiful” response to the “Maoist-infestation”. Despite the government’s public insistence that it is always “open to talking”, its actions indicate the contrary. In July 2010, the Naxal-Maoist’s chief negotiator for the proposed peace talks was killed at point-blank range by the state police, along with his journalist companion. This does not signal willingness to compromise. The violence of the state in forcing thousands out of their sacred ancestral homes is normalised as the path of “economic progress”, whilst any resistance is coloured as one of senseless terror. The standout piece in the collection is ‘Walking with the Comrades’ – a lyrical reportage of Roy’s three weeks spent following the Maoist guerrilla fighters in the Chhattisgarh State in late 2009, shortly after the launch of ‘Operation Green Hunt’. Rich, visual and lushly poetic, it is faithful to her undeniable skill as a storyteller. This has attracted criticisms: some have accused Roy of being cloying and self-indulgent, or of romanticising – and thus trivialising – her subject matter. But while being unsurprising, such critiques largely miss the point. What is a factional conflict in a far-away part of the world – one of many such conflicts, mostly out of view for Western audiences – becomes tangible through Roy’s voice. She succeeds in giving a credible international voice to the dissidents while resisting the temptation to play down the failures of the movement. Some might prefer to abstract from and theorise about the experience of human conflict; Roy chooses to live and breathe it. The palpable realism of the essay draws out the universality of the Naxal-Maoists’ struggle – it is the struggle inherent in the relationship between the powerful and powerless. It is refreshing to read a writer so unabashed in the humanism of her prose. 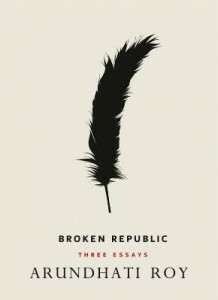 An intensely informative and astute analysis, ‘Broken Republic’ is somewhat let down by the publisher’s decision to present it as a quasi-coffee-table book. The generous dollops of emotive photography are superfluous, considering the strength of the writing. A minor critique of an otherwise important work by the tirelessly passionate Arundhati Roy. Lucy Du is a writer, poet and undergraduate at Oxford University. « Previous: Analysis | Guatemala: Return of the Iron Fist? 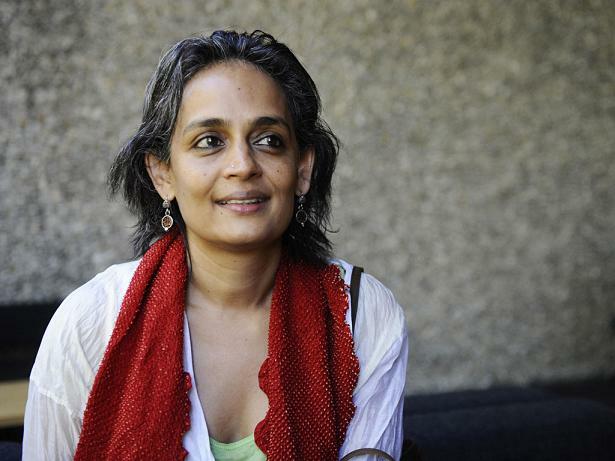 Arundhati Roy has questioned India as being a democratic state many times in the past. I recognize her a great human right activist rather than a famous novelist. She has not fought for the right of the oppressed people not only in India but also in Palestine. For her human right activism, she has been demonized both by the Bahramin and Zionist mafia. I have written about Arundhati Roy on my blog. In August 2011 – Roy blasted Anna Hazare being a hypocrite. She theorizes the Humanism, Human Conflicts, Human Rights, and the analysis of the Neo Imperialism Political State. Mrs.Roy’s explanation of the realistic realism and the contemporary struggling between the powerful state power, super power and powerless is reality in the subcontinent and so on other part of the world.